Amanda Rosenbloom, proprietor of Astor Place Vintage, thinks she’son just another call to appraise and possibly purchase clothing from a wealthy, elderly woman. But after discovering a journal sewn into a fur muff, Amanda gets much more than she anticipated. The pages of the journal reveal the life of Olive Westcott, a young woman who had moved to Manhattan in 1907. Olive was set on pursuing a career as a department store buyer in an era when Victorian ideas, limiting a woman’s sphere to marriage and motherhood, were only beginning to give way to modern ways of thinking. As Amanda reads the journal, her life begins to unravel until she can no longer ignore this voice from the past. Despite being separated by one hundred years, Amanda finds she’s connected to Olive in ways neither could ever have imagined. 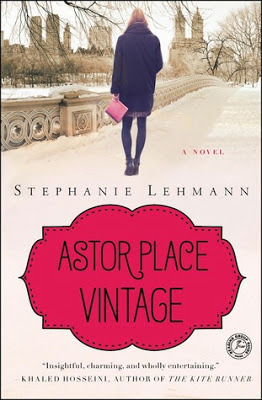 My thoughts: I have to tell you that I liked ASTOR PLACE VINTAGE a lot! A LOT! I carried my e-reader with me everywhere I went. It all starts with vintage clothing store owner Amanda being summoned to the home of an elderly woman, Jane Kelly, because she's wanting to sell some of her old clothing. Jane's pretty cranky, but straight forward. She know's she is dying and wants to be rid of some of her things. Of course Amanda bought Jane's lovely vintage clothes! As she begins to examine her purchases for soiled areas, rips to be repaired or loose buttons to sew on, she finds a journal sewn into the lining of a fur muff. The date on the journal is 1907 and was written by a young Manhattan woman named Olive. Of course Amanda reads it...even before telling Jane that she's found it. And that's where ASTOR PLACE VINTAGE grabbed me. Author Stephanie Lehmann brilliantly weaves a year of Olive's life, her struggle in Manhattan as it was over a hundred years ago and the struggles Olive has surviving on her own after the death of her father, into the fabric that makes up not quite a week of Amanda's present day life. Lehmann does everything right, the stories of both women are engaging and thought provoking. So often, when you read a book that takes you back and forth between the present and the past, you are more invested in one character over the other. This didn't happen for me with ASTOR PLACE VINTAGE. I was curious about the life that Olive had to lead, I appreciated that her struggles in the world of 1907 weren't always from the "usual suspects" - the usual road blocks and prejudices that we expect to read about. And I was just as interested in Amanda and her struggles as a woman in Manhattan now, her fights with a landlord's agent and a frustrating love life. As Amanda absorbs Olive's story, she begins to understand her own life and situations more, she learns that things aren't always as they seem, and that people can surprise you. Without spoiling the story line, let's just say that Amanda learns about life from Olive and from Jane. Olive was at the beginning of her life's story, and Jane is at the end of her life's story. Amanda holds a mirror to own life's story and sees different possibilities for herself. I can't recommend ASTOR PLACE VINTAGE enough. It's a fabulous read and I think it'll hold your attention the way it held mine. Don't miss it, add it to your "must read" list and suggest it to your Book Club for the next read! Shoot, give it as gifts! 4 1/2 out of 5 stars! **This e-galley was provided to me by the publisher through Edelweiss.abovethetreeline.com in exchange for a fair and honest review.